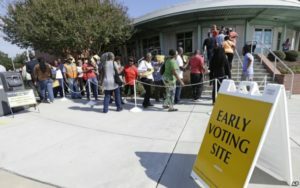 In light of recent developments involving the FBI and WikiLeaks, early voting by blacks may be the key if Hillary Clinton is to take the battleground state of North Carolina. Four years ago, black North Carolinians made up 30 percent of early voters despite being just 22 percent of the state’s population. North Carolina is opening 145 more early voting sites later this week. “That’s why I say Saturday is huge for Democrats and black voters,” said Mike Bitzer, a political scientist at Catawba College in Salisbury. African-Americans vote Democratic 95 percent of the time and are “the most reliable core” of that party’s coalition, Bitzer said. In the first week of early voting, the percentages of Democrats and Republicans were lower than four years ago, with unaffiliated voters the only group to gain ground. Four years ago at this time, black voters had cast 28 percent of the ballots, according to Bitzer. This year, African-Americans make up 22 percent of votes cast, “a significant drop,” he said. In 2012, GOP candidate Mitt Romney was behind in early voting before surging ahead on election day. Bitzer said Clinton’s strategy is to try to replicate, as much as she can, “the Obama coalition” in North Carolina.